We've been selling Jaroslav's guitars for years now and he has a close relation to our shop. When he told us he had been interviewed by the Japanese Gendai Guitar Magazine, of course we were excited. We were lucky enough to receive the English translation and thought it might be nice to share it with you, Enjoy! From this issue, we are going to cover guitars that are not well known yet in Japan for this guitar introduction section. This time, it is the guitar by Jaroslav Mach from the Czech Republic. Mach in association with sonic speed, it is also Ernst Mach. It seems that it comes from an Austrian scholar. We can see the word Holland on the label, but Jaroslav Mach is Czech. He was born in 1950 in the Czech Republic (it was Czechoslovakia at the time). In 1968, he moved to Holland. He began the guitar making as a self-taught from 1975. However, in 1989, he gave it up to take up another occupation. In 2012, he returned to his native country the Czech Republic and resumed guitar making to respond to the demand from his old clients. 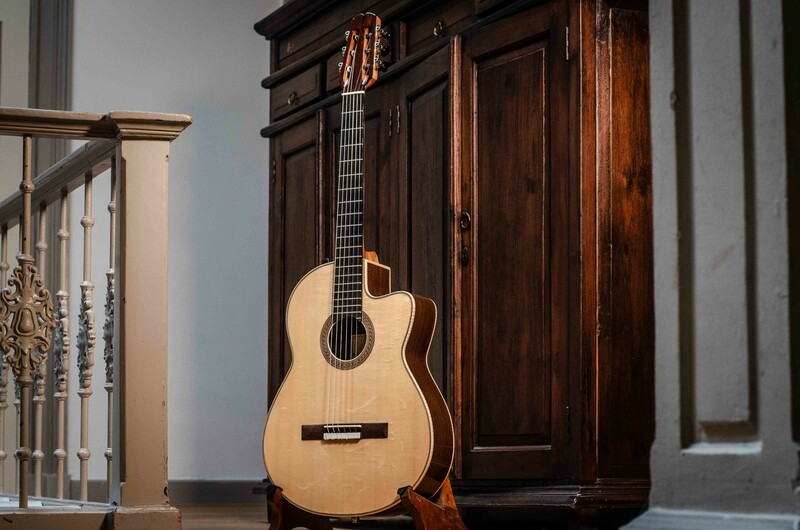 Apart from classical guitars, we can find a Modern OM (Martin’s orchestra model) which is a steel-string acoustic guitar and a 10-string guitar with nylon strings on his website. It seems that know-how developed in building both the nylon-string and the steel-string guitar was implemented, the round-shaped body is the same throughout (Modern OM's neck-to-body joint is located at the 14th fret). We can find a reference to CITES (the Convention on International Trade in Endangered Species of Wild Fauna and Flora (aka Washington convention in Japan) on another page of the website on which he specifies the avoidance of the use of regulated rosewood types. He uses Wenge from Africa instead of so-called jacarandá (Brazilian rosewood) or Central and South American rosewood. He claims that the sound is similar to the jacarandá guitar. It is a dense hardwood with characteristic fine striped grain. Despite this new direction, he opposes to the trendy double-top and lattice bracing. He says that extreme pursuit for the volume causes detriment to the tonal quality. As the transparent photo above shows, he employs the fan bracing with nine braces. He says that he took it from Ignacio Fleta’s structure. His only employing spruce for the top avoiding western red cedar would be a traditional aspect of his. As for strings, he recommends nylon strings over carbon ones. He says that normal tension is appropriate, although hard tension also suits to make the sound brighter. "As for the tuners, he uses Swiss-made Schertler’s single unit. It has plain oval plates with an 18:1 gear ratio, ebony knobs, and black rollers, which is rare in Japan. They feel very smooth and luxurious”. Now, let’s talk about the sound of Mach guitar. First of all, it has a rich volume and crystal clear tone. I wonder if it is a German sound rather than a Spanish one. The guitar in the photo was made as a response to the request of a client who needed a more direct and loud sound. It was made of the Sitka spruce (common in steel-string acoustic guitars), and the sides have a double layer. I was told that, in the end, this guitar was not sold to the client because of a financial issue. Normally, he uses spruce from Austria for the top which is aged more than 30 years combined with single-wood sides. By making the guitar lighter, I imagine that its sound will be more similar to a traditional one. We hope you enjoyed this article! For more information on Jaroslav Mach guitars, please feel free to contact us or CLICK HERE.